Posted by Mollie Hamelund on February 8, 2019 in Basketball, Sports, Top Dawg. 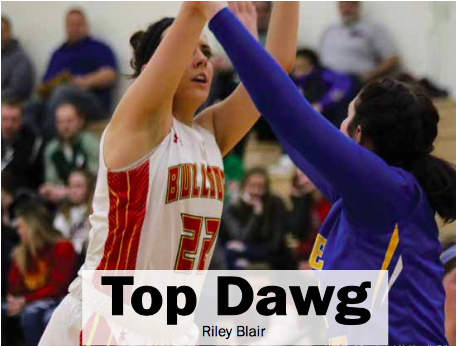 This week’s Top Dawg goes to Ferris junior guard Riley Blair, who won GLIAC Player of the Week for her 20-point performances. Ferris’ women’s basketball team looked unbothered during their last two games, defeating both Lake Superior State University (LSSU) Saturday, Jan. 26, and Saginaw Valley State University (SVSU) Thursday, Jan. 31. The team dominated both games by scoring at least 60 points in each. Blair has been stepping up her game these past few weeks and has been leading her team in points the last few victories. In the 62-46 victory over LSSU, Blair scored a total of 20 points for the team and 12 overall rebounds. Blair also had 21 points and seven rebounds in the 60-56 victory over SVSU. With 19 games under her belt this season, Blair has racked up a total of 172 points scored while adding 79 rebounds and 12 steals. For the overall season, she has averaged 9.1 points per game, but in the conference, she has raised her average to 10.7. Blair wasn’t part of the starting five this season but when players were out with injuries, Blair was brought up to starting. Bringing Blair into the starting five became a beneficial move for Ferris women’s basketball head coach Kendra Faustin, as Blair is responsible for 13 percent of the team’s total points this season. Blair and the rest of the Bulldogs look to keep their undefeated home record against Ashland University 5:30 p.m. Thursday, Feb. 7. The game will be available to stream on ESPN3 and the ESPN app for the Division II Game of the Week.